Eating really isn’t a difficult task. Eating at a fancy restaurant isn’t easy. Eating spaghetti politely isn’t easy. And eating raw vegetables quietly isn’t easy. I’m not going to help you figure out the aforementioned eating scenarios – because I’m no expert – but I will help you in understanding the proper way to eat a pepperoni roll! It was a true West Virginia innovation— a snack that needed no refrigeration or heat, but hearty enough to be a meal. Something to pack on a hike, a day at the river or camping for a few days. First things first. You should acquire the pepperoni roll. But where?? 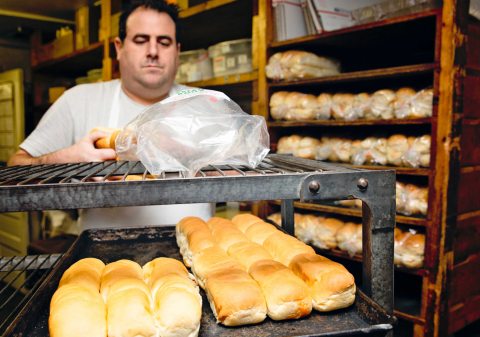 Country Club Bakery is home of the original pepperoni roll. I already know what you’re about to ask… What was the original pepperoni roll? Well, way back in the early coal mining days (like the 1920’s), there were tons of Italian immigrants working underground, and they probably ate bread and pepperoni or salami for lunch. One miner, Giuseppe “Joseph” Argiro, figured it would be easier to bake the pepperoni in the bread and eat them together rather than separately. The ingenious hack caught on and he eventually quit the mines to open – you guessed it – Country Club Bakery. It’s not the OG, but it started way back in the 1950s, so it’s pretty old, too… Colasessano’s pepperoni buns aren’t your typical pepperoni roll, namely because they’re buns. So this means that the pepperoni is baked in bread that’s sliced open (kind of like an infinitely better hoagie), and filled with meat sauce, provolone cheese and Italian-style peppers cooked in tomato sauce and spices. To answer your question: Yes, it is as delicious as it sounds. Noteworthy Sweets hasn’t been around for decades, but it has become an absolute staple for their locally sourced meals. One of those meals would be their humongous rolls stuffed full of pepperoni! Don’t let the name confuse you: Mario’s New York Style Restaurant is still as Appalachian and Italian focused as anywhere else. The ‘Roni Roll is essentially still a pepperoni roll but with a twist. Instead of using a traditional bread recipe, they use their pizza dough. Therefore the “Roni Roll isn’t as “fluffy” and the pepperoni is sliced and slightly exposed. Add cheese and a side of marinara sauce on the side and you’re in for a real treat. Little Red Hen Bakery’s version is the newest in town in a long time (c. 2018). And their version pays homage to tradition, but… They use ground pepperoni. Anyone not from West Virginia, might not understand the gravity of this situation. The majority of ‘eers prefer pepperoni sticks; some like slices; but ground pepperoni isn’t even on the radar. This is new, daring, some might even say gauche, but the real question is… Is it any good? Well, no. It’s actually way better than good, thereby teaching all of us that some risks really do pay off. The pepperoni roll is no laughing matter here in West Virginia. As simple as it seems, the flavor of a pepperoni roll is deliciously memorable. It’s so in demand that it’s ubiquitous within state lines; find them at any grocery store or gas station in West Virginia. Country Club Bakery and Colasessano’s both ship their Italian American goods around the country! Because it won’t be fresh out of the oven, there are some steps you can take to ensure quality enjoyment. For Country Club Bakery pepperoni rolls, reheat by popping them in an oven in a baking dish for seven minutes on 300 degrees, or in the microwave for 10 seconds. When reheating Colasessano’s, however, you’ll want to bake it at 350 degrees for 15 minutes (or until the cheese melts). They’ll come wrapped in foil so reheating in the microwave isn’t an option. If you’re here, however, Noteworthy Sweets, Little Red Hen, and Country Club Bakery pepperoni rolls should be eaten within two days for maximum freshness and deliciousness. During that time frame, heat them up as instructed above. As for gas station or grocery store pepperoni rolls, those should only be eaten in a car, driving fast to get as quickly as possible from Point A to Point B. Why? Because, well, there’s so much to do and see in Marion. If there’s a brave soul out there who wants to try his or her hand at this delicacy, Taste of Home has one of my favorite bread recipes. Just add about 72 sticks of pepperoni (about ‘4 long) to make pepperoni rolls. *For a “deluxe” version, split the roll and add peppers (preferably Oliverio’s Italian Style Peppers) and cheese! Place rolls flat on baking sheet. Place pepperoni sticks and mozzarella stick in center and roll. No matter which pepperoni roll you buy or make, all of West Virginia hopes you enjoy a little Italy in Appalachia. Which do you prefer, stick, slices or ground pepperoni?